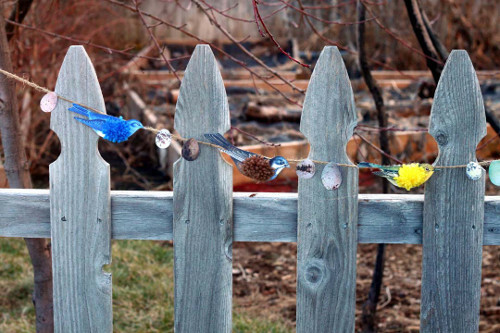 Creating this garland of beautiful birds and eggs to decorate your spring home is an easy project that will take you minimal supplies, and next to no time to complete. 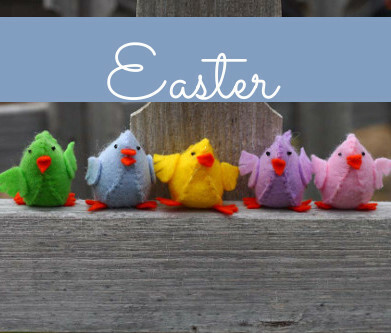 I’ve created a single file of all of the vintage bird and egg pictures I used, compiled from images from my favorite site for free vintage art, The Graphics Fairy, so all you have to do is print the PDF file and get started crafting! 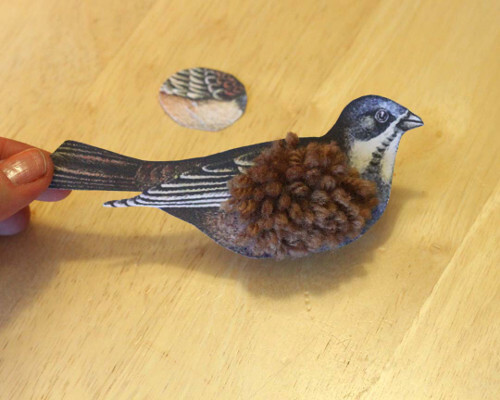 This is a fun project to do yourself, or a good project to get the kids working on. 1 print-out of Beautiful Birds PDF, printed on cardstock paper. Red Heart yarn in: orange, yellow, cardinal, medium brown, and skipper blue. Darice Jute 2 Ply, Natural. 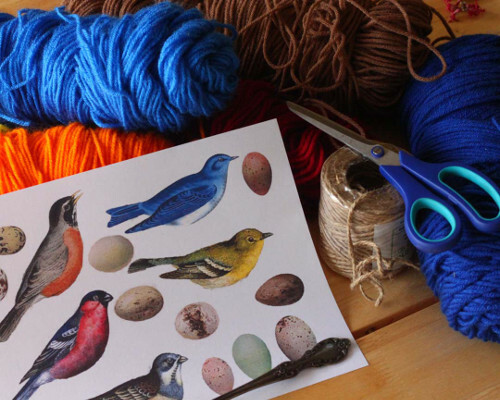 To begin, cut out all of the birds and eggs on the print-out. Next, we’re going to make fork pom-poms. 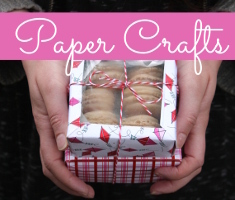 Please refer to one of my past tutorials HERE for the directions to make fork pom-poms. The only thing that I did different with making these fork pom-poms, as opposed to the ones in the tutorial, is for the bird pom-poms, I wrapped the yarn around the fork tines 40 times, instead of just 30. 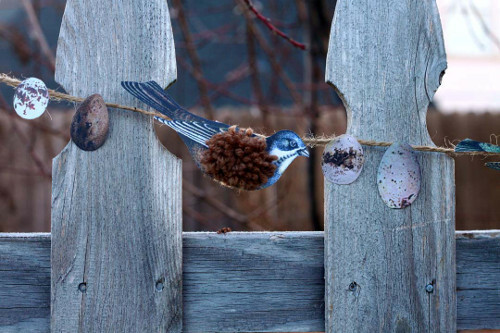 This gave me a fuller, and more oval shaped pom-pom as a result. 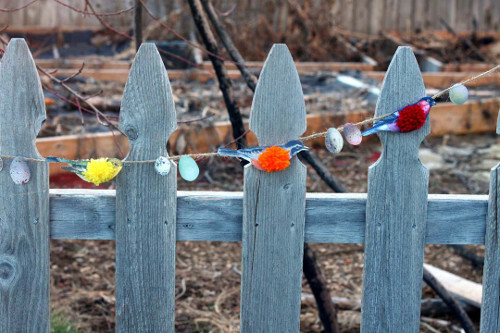 Make one pom-pom in each of the 5 colors of yarn. 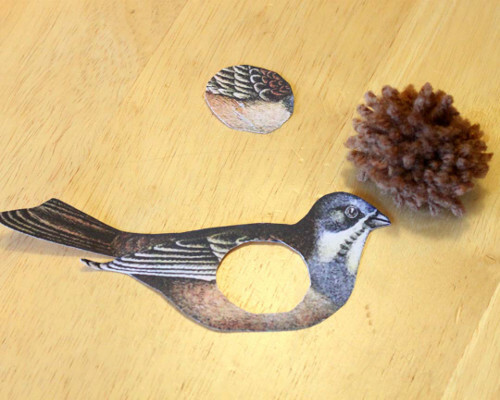 Match up each pom-pom to its corresponding bird, and carefully insert each pom-pom into the hole that you cut out of each bird graphic. 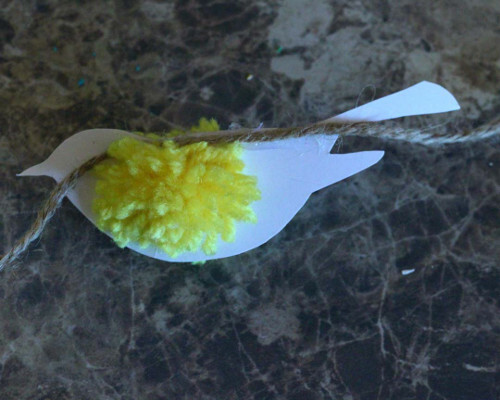 Push the pom-poms into the holes so that half of the pom-pom is on each side of the paper bird. Mine fit so snugly that I didn’t even bother to glue them in place. If you don’t feel like yours fit snug enough, you may want to secure them with a dab or two of hot glue. Cut a length of jute to whatever length you desire. I wanted to hang my garland along my fireplace mantle, so I measured and cut accordingly. 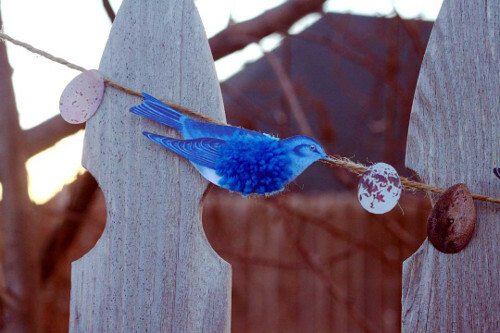 Next, space your birds along the garland, leaving room in between for the eggs, and then glue them onto the jute by running a line of hot glue along the back edge of each paper bird. 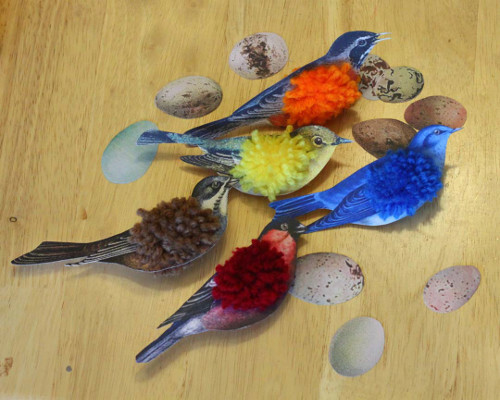 Glue all of your birds into place, and then glue the eggs on in between. Now, stand back and admire how such a simple project can be so pretty! 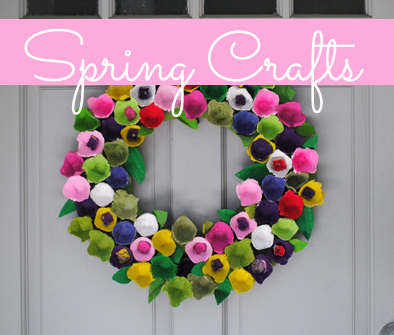 This entry was posted in Bunting & Garlands, Crafts, Holidays & Seasons, Kid's Crafts, Spring and tagged Printables, Yarn on February 17, 2015 by Michelle.